Natchez City Hall is located at 124 South Pearl Street, Natchez, MS 39120; phone: 601-445-7500. Photo: Erected between 1816 and 1821 in the fashion of a Federal style villa, Arlington established the basic model for the setting, exterior design and interior decoration for homes in the Mississippi region. Situated amid a garden of azaleas and oak trees, this antebellum house epitomizes the architectural qualities for which Natchez is famous. Historic American Buildings Survey [HABS MS-17-8], photographed by Ralph Clynne, 1934, memory.loc,gov, accessed July, 2011. The opening of the Mississippi River started the turbulent flatboat era that lasted until the steamboat brought it to an end. Down the river came the flatboat men, swearing, drinking, fighting; bringing on their clumsy rafts, tobacco, grains, fruits, pelts, molasses, hams, butter, flour, and whisky. Many of them stopped at Natchez to sell their goods and their boats; most of them continued to New Orleans; but all returned through Natchez, since it was too difficult to return to the upper country by water. Banding together for protection against prowling savages and murderous outlaws, they returned home, carrying their money in money belts or in saddlebags. They followed the 550-mile road to Nashville, a road that was a mere trace or bridle path. This road became famous as the Natchez Trace. A frontier city, capital of a rich territory, Natchez soon grew important as a supply depot and the gathering place for the intellectuals of the Southwest. It became an opulent, suave, and aristocratic community, maintaining a social and political prestige that influenced the entire Mississippi Valley. Men of all degrees of wealth and intelligence were drawn to this new region where land was cheap and fortunes were quickly made. Hundreds of families drifted down the river from the upper valleys in fleets of flatboats. These pioneers came to a rich and fertile country that had a mild climate featured by a growing season nine months long. They tried raising indigo but the refuse accumulations, with the poisonous drainage from them, made it unhealthful. They tried raising tobacco and found it unprofitable. After the invention of Whitney's cotton gin in 1793, they turned to growing cotton. Slave labor, together with natural advantages, enabled them to create in a remarkably short time a system of great plantations and luxurious living. The Mississippi Gazette, first newspaper in the State, began publication in 1800. On April 9, 1803, Natchez was incorporated as an American city. Increasing prosperity made it necessary to establish an overland line of communication with the East. Hitherto, the Mississippi River had been the one route of travel. In 1801 the Treaty of Chickasaw Bluffs was made with the Chickasaw Indians whereby the Indians agreed to permit immigrants, the United States mail, and soldiers to pass through their lands. The immediate effect of this agreement was a sudden growth in the population of Natchez and the lower Mississippi Valley. Droves of settlers toiled down the Natchez Trace from the Atlantic seaboard, bringing new blood, new ideas, and new wealth in money and slaves. In 1802, however, Natchez lost much of its prestige when the Territorial Assembly ordered the seat of government moved from Natchez to Washington, a small, gay, wealthy, inland city situated about six miles to the east. Because of the growing importance of Natchez as an entrance to the West, Aaron Burr and Harman Blennerhassett selected it as the base from which to operate their mysterious colonization scheme. The plan was broken up when both were arrested, charged with treason. During the War of 1812 the city was threatened frequently by Indians who lived in the wilderness east of the river. All able-bodied men became soldiers, and when the Battle of New Orleans was fought in 1815, the Natchez Rifles was present. One historian related that nearly all the male citizens of Natchez took part in the battle. In 1817 the Mississippi Territory was organized as a State. The convention met at Washington and decided to move the seat of government from Washington to Columbia, then to a more central location at Le Fleur's Bluff (Jackson). From this time on, the political eminence of Natchez declined. The booming steamboat era, however, had just begun with the arrival of the New Orleans, first steamboat to stop at Natchez, and within a few years the city recovered its prominence by becoming one of the great cotton ports of the world. In this period fabulous fortunes were made by cotton planters, and Natchez reached a pinnacle of wealth and culture with liberal, open-handed living prevailing. Planters spent their money building distinctive homes and accumulating libraries and art collections. They speculated in land, slaves, cotton, and credit. While much in their lives was gracious, their code demanded exaggerated standards of honor. Duels were fought frequently on the sandbar across the river. 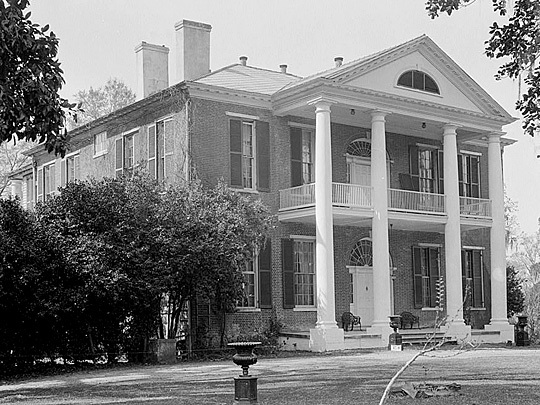 At the outbreak of the War between the States Natchez was still a rich agricultural center. It furnished many soldiers to the Confederate cause, most prominent of whom was Maj.-Gen. William T. Martin. Natchez was bombarded by the U. S. S. Essex in July 1863, and occupied by Ransom's brigade. Civil government was suspended from November 1863 to August 9, 1865. The war destroyed the fortunes, slaves were freed, and the economic and social structures were overturned completely. Natchez has never regained the river trade that once had helped to make it rich, one of the queen cities of the lower Mississippi.